Artists depict stories from history. Artists depict stories from the Bible and other religious texts. Artists depict stories from literature. Let’s look at a work of art that tells a story from each one of these spheres. Describe what you see. The work portrays a man dressed in an airman’s clothing, laced-up boots, and an unopened parachute strapped to his back. Is their anything unusual about this man? There are planes embedded in his body. Is there any element of art, such as color or shape, which makes all the individual parts come together? The gold color makes all the parts come together. How is the figure standing? Is he relaxed? Is he agitated? Describe him. He is standing tall and is facing forward with his body held tight. Now describe the features of his face. His eyes are shut tight. Tell me about his hands. His palms are open. What do all these features do to the mood of the piece? Do they make the figure seem powerful yet at the same time calm and at peace? Pilots of a U.S. Army Air Forces fighter squadron, known as “Tuskegee Airmen” in February 1944. If I were to tell you this figure represents a brave citizen who fought in a war to protect his community from its enemies, would that help you to better understand this work of art? Would you say the artist depicted a brave citizen well? What do you see that makes you say that? Who is he? I will give you a clue. He is a Tuskegee Airman. 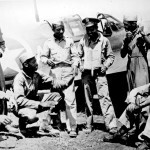 Do you know who the Tuskegee Airmen were? They were a group of African American Air Force pilots who fought during WWII (1939-1945). WWII was the most widespread war in history. It involved most of the world’s nations. Fifty to seventy million people lost their lives during WWII, making it the deadliest conflict in human history. 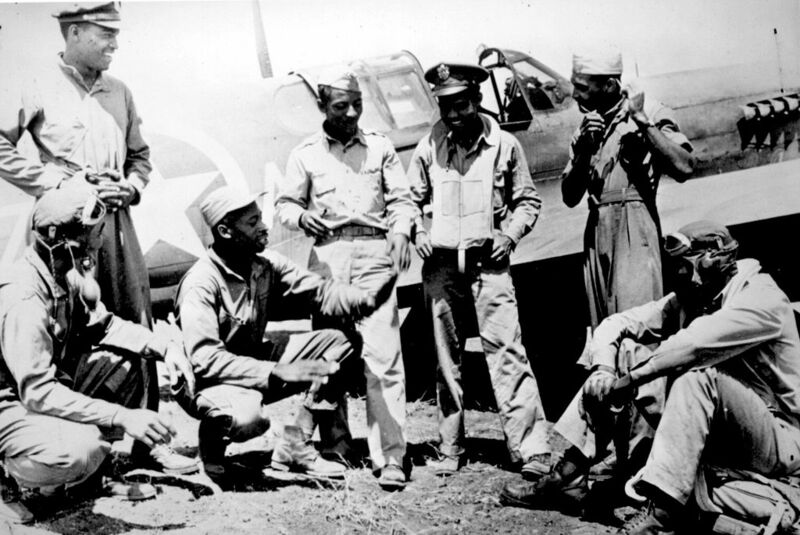 The Tuskegee Airmen were the first African American military aviators in the US armed forces. They were willing to sacrifice their lives so their fellow citizens could live in peace. Together with their allies, the Tuskegee Airmen were victorious, but their heroism and bravery were not truly recognized until long after the war had ended. What character traits do heroes possess? They possess courage, self-discipline and perseverance. This work is called Tar Baby vs. St. Sebastian. Have you ever read the story Tar Baby? Tar Baby is a southern folk tale about entrapment. In the tale, Br’er Fox makes a doll out of a lump of tar, dresses it with clothes, and then places it on the side of the road. Br’er Rabbit comes along, and he addresses Tar Baby but of course receives no response. Br’er Rabbit becomes offended, punches Tar Baby and in doing so becomes stuck. In anger, he punches and kicks Tar Baby more and gets stuck even worse. Br’er Fox comes in for the kill, but Br’er Rabbit outsmarts him. He pleads, “please Br’er Fox, don’t fling me into the brier patch,” prompting Br’er Fox to do just that. Rabbits are at home in thickets, and Br’er Rabbit is able to escape. Do you think there is a message to this story? Perhaps the message of the story is a problem gets worse the more one struggles against it. Br’er Rabbit learns how to outsmart his enemy with intelligence—not brut force, doesn’t he? But what about Saint Sebastian? Who was he? Sebastian was a soldier who became a saint. Sebastian refused to deny his faith and was tied to a tree and shot with arrows. He was then rescued but soon afterward was clubbed to death. 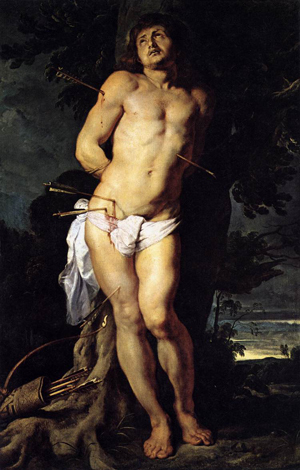 In art, Saint Sebastian is typically shown tied to a tree, arrows piercing his body. 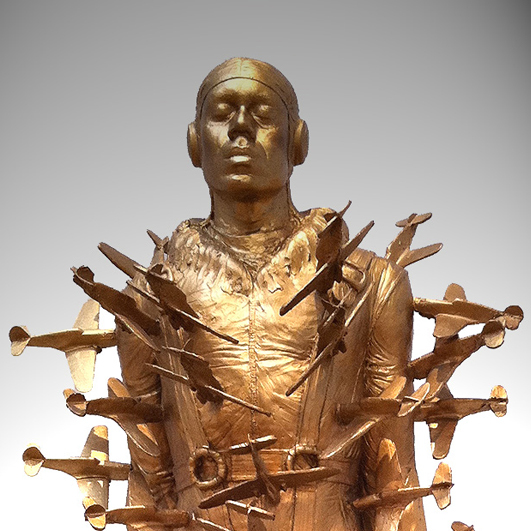 In a similar fashion, this artist embedded his sculpture of the Tuskegee Airman with planes. How are the actions of St. Sebastian and the Tuskegee Airman similar? Both St. Sebastian and the Tuskegee Airman were willing to sacrifice their lives to protect their beliefs. They were both willing to sacrifice themselves for a greater cause. Why do you think the artist called his work Tar Baby vs. St. Sebastian? Why is it Tar Baby verses St. Sebastian? Why is one character opposing the other character? Perhaps the artist is telling us that as people we have two choices. We can be non confrontational like Tar Baby, use our wits in dealing with our enemies, and keep our true natures to ourselves. Or we can put ourselves at risk no matter what the cost like St. Sebastian, be confrontational, and remain steadfast in our beliefs. Which way would you behave if you were in a similar situation? Think about this for a moment. It is important to know who the Tsukegee Airmen and St. Sebastian were and know the story about Tar Baby. Knowledge of history and literature helps us to understand the meaning of many works of art. In this case, there is a personal story as well. What if I were to tell you this work is a self-portrait of the artist who made it? Would that change how you view this work? Why do you think the artist portrayed himself as a Tsukegee Airman in a posture similar to that of St. Sebastian? Do you think the artist was trying to tell us something about standing firm in the face of danger and confronting one’s enemies directly? Would you like to see Tar Baby vs. St. Sebastian in person? All you have to do is visit the North Carolina Museum of Art in Raleigh, North Carolina. Tar Baby vs. St. Sebastian is in the Modern galleries at the museum. Or perhaps you would like a tour. Tours of the collection are given daily, except for Monday when the museum is closed to the public. If you prefer, you can contact the museum ahead of time and arrange for you and your friends to have a private tour. I’m sure a docent at the museum would be happy to show you and your friends Tar Baby vs. St. Sebastian and many other works of art. Whether you visit the museum on your own or have a tour with a docent, it will be well worth your time!